Seventy years ago, the organisation founded by “Bacon Priest” Werenfried van Straaten (1913-2003), Aid to the Eastern Priests (today Aid to the Church in Need (ACN)), initiated the campaign “A vehicle for God”. So-called “rucksack priests” were given vehicles so that they could dispense pastoral care to the displaced Catholics of the German diaspora after World War II. “I give religious instruction at seven schools and regularly celebrate Holy Mass in three centrally located towns. Each week I travel 215 kilometres by bicycle, often in the rain and snow, along streets and paths that are covered with ice or slush in the winter, with mud in the spring and with loose sand in the summer.” Letters of complaint such as this one were what inspired Father Werenfried van Straaten to provide priests in post-war Germany with a set of wheels. As a result of the horrors of war and the division of the former German eastern provinces, more than 15 million people were forced to leave their homes. More than half of the displaced persons were Catholic. Many of the East German Catholics were resettled in regions that were almost exclusively Protestant and had not seen a Catholic church in centuries. About 3000 priest, “heroes of pastoral care”, provided spiritual comfort and administered the sacraments in these regions. As they themselves had also been displaced from their former homes, they travelled on foot from one place to another, carrying the liturgical vessels for Holy Mass with them in their rucksacks. The priests looked like vagrants with their threadbare clothing and mended rucksacks. They were on the go for hours each day, covering hundreds of kilometres. They braved wind and weather, usually on foot or – the more fortunate ones – by bicycle. Severely weakened from the hardships borne during their own expulsion, many of the priests died. Not long after the war had ended, in 1947, Father Werenfried was quick to recognise the material and spiritual needs of those who had been displaced. The native Dutchman and Premonstratensian from Tongerlo Abbey in Belgium was a visionary of charity. He trusted in God, in the good in people and in the power of forgiveness, even between those who had once been bitter wartime enemies. He worked tirelessly, at first collecting clothing and food in Belgium and the Netherlands for the people displaced. 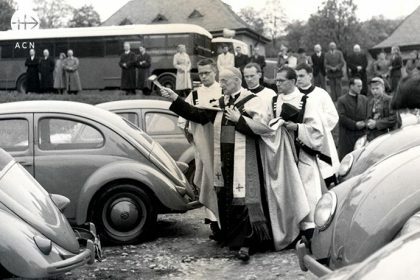 Cardinal Frings from Cologne blesses the Volkswagen during a launching ceremony for the chapeltrucks in Königstein, 1952. He is blessing the first seventy “vehicles for God” (Volklswagen) provided by Flemish students an youth groups for the rucksack priests. When Father Werenfried preached about “convoys of aid”, that is exactly what he meant. 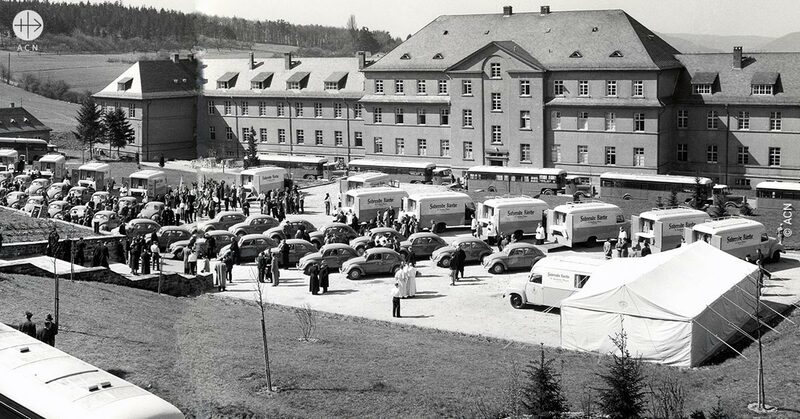 Seventy automobiles and 14 so-called “chapel trucks” were blessed on 22 April 1952 in Königstein im Taunus, the most important religious centre for displaced Catholics and today the international headquarters of ACN. The chapel trucks were semi-trailer trucks that had been converted into mobile chapels. From that day on for the next two decades, the chapel trucks from Aid to the Eastern Priests were on the road with a team of one German and one foreign missionary and a driver. The Church literally came to the villages to give displaced persons the courage to go on living. One driver recalled, “We drove a behemoth of a truck”. He felt like a “lion tamer” at the wheel. After all, each chapel truck was 14 metres long, two metres wide, three metres high and weighed five tons. One of the side walls could be folded out to reveal the altar. The entrance to the confessional was on the other side. Accommodations for the two priests had been set up in the rear of the truck, while the driver slept up front in the cab. The large chapel trucks headed out for the last time in 1970. The trucks had stopped in hundreds of places in Germany and even some places abroad. The mobile chapels became the spiritual havens for countless displaced persons during the difficult post-war period. This is how the motorisation of pastoral work became one of the key focuses of Father Werenfried’s organisation, which is called Aid to the Church in Need today and has been a pontifical foundation since 2011. This is still true today. In many countries worldwide, the distances between villages and towns are much larger than in Germany. A single parish can be larger than an entire diocese there. To ensure that God’s workers do not “become stranded” on the way to Holy Mass or to visit a sick or dying person, ACN provides funding for vehicles appropriate to the local conditions – all-terrain vehicles, motorcycles, bicycles and sometimes even boats.